Generally, the most valuable of diamonds are those with the least color; however, a completely colorless diamond is extremely rare. The diamond color scale ranges from “D” (without color) to “Z” (light yellow or brown). Each letter “grade” represents a range of color and is a measurement of how noticeable that color, or lack of color, is. This is measured by the existence or absence of visible flaws. Tiny surface blemishes or internal inclusions, even those seen only under magnification, can alter the brilliance of a diamond. Clarity levels begin with Flawless and end with varied levels of Inclusions. While cut does include the shape of the diamond, in the case of the 4Cs, it refers to the proportions of the cut. 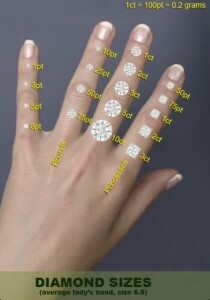 A diamond’s cut grade is an objective measure of a diamond’s light performance or the amount of sparkle a diamond has. Cut is made up of the size and position of a diamond’s facets. When a diamond is cut with the proper proportions, light enters the diamond and is returned through the top of the diamond. If it is cut too shallow or too deep, this will effect the brilliance of the diamond and how is shines, or shines less than a similar diamond. This refers to a diamond’s weight. 1 carat, the traditional unit of measurement for diamonds, is about 0.2 grams. The weight of a diamond can also be described in “points.” 1 carat equals 100 points, so a 75 point diamond would be equal to .75 carats. Helpful hint, it has been our experience that most women will choose a slightly larger diamond over a smaller diamond of better clarity or better color.